I am so thrilled to have the opportunity to guest design for Emma from My Creative Time. I instantly fell in love with her greeting sets the first time I saw them. They are made from the same high quality peachy rubber you have come to love from Peachy Keen. They stamp wonderfully with all kinds of inks and the sentiments are truly awesome! 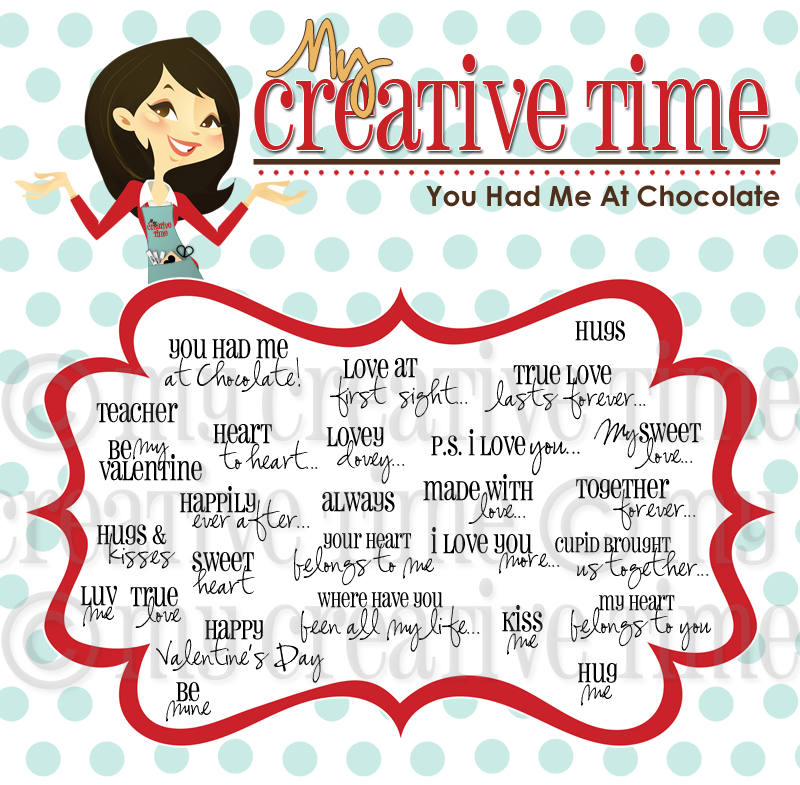 Today I'm using a set called "You Had Me at Chocolate". Below is a picture of what you get in the set. Take some time to check out her other stamps HERE. I created this special project just for you! 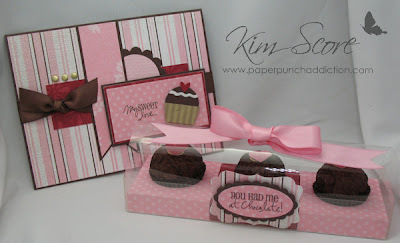 Below the photo is a downloadable tutorial for the Ferrero Rond Noir candy box with Bon Bon card. ENJOY! If you love this project, you'll be thrilled to know that Emma has asked me to design a project once a month. You can look forward to more fun and inspiring projects featuring these fantastic stamps! What a great card and box. Thanks for sharing the tutorial. Congratulations Kim. You so deserve recognition for your wonderful work and inspiration to so many people out here in blogland. Love your project! This is so beautiful! What a perfect gift for somebody!!! How marvelous Kim and richly deserved too! I look forward to seeing more of these stunning projects you create so beautifully, in the months to come. just beautiful! thank you so much for the instructions...I think I will be seeing many of these all over everyone's blog soon!!! So pretty. Thanks for sharing your tutorial. Thanks for the great tutorial Kim. Going to try this one. Yes, I'm thrilled that you'll be doing a monthly post for Emma, especially if they're all gonna be as spectacular as this one. You are AMAZING! Beautiful Job!New Follower. Very excited! Congrats on your guest spot and thank for the tutorial. Great job loving the colors and the paper is so pretty. Nice job w/ the chocolates.. Yummy. Congrats on being guest designer. Love this cute little box, Kim! Thanks so much for sharing the tutorial! Hugs!! Fabulous project. Wish I had some of the candy now, Kim. Thanks for the lovely project, Kim!